Over the last few years my trips to Kolkata were quite frequent and in contrast to the standard visits in summer, I happened to be in Kolkata in the winters too. Moni's house is in a quiet lane in Selimpur and a variety of vendors come to the 'goli' or lane calling out their wares. From umbrella repair to ice cream, from variety plastic products to fresh veggies and fish, everything comes to our doorstep. 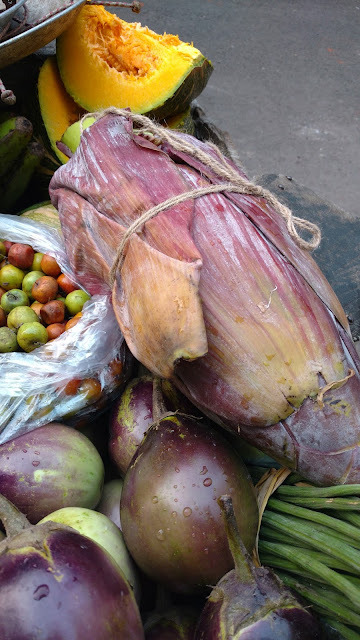 I found the steady stream of vendors quite entertaining and slowly began to buy vegetables and fish for the novelty of buying at the door, so much in contrast to my life in Mumbai where veggies were either bought online or from a supermarket, an entirely impersonal experience. 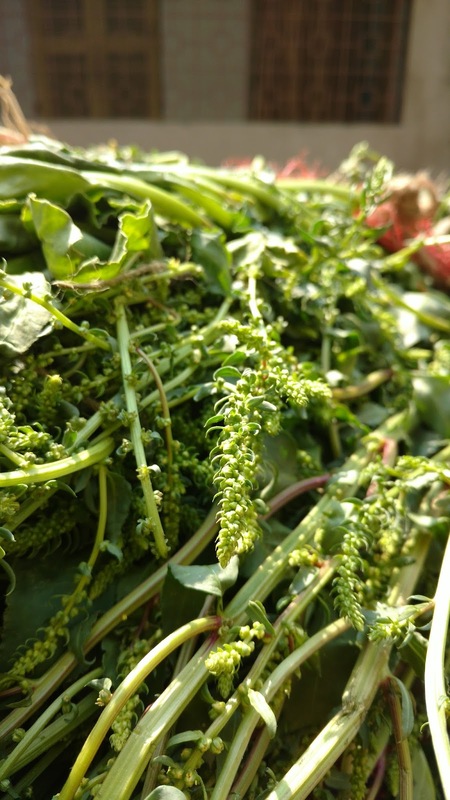 As I chose vegetables every morning I started examining the variety on the cart more closely and questioning the vendor about specific vegetables I was unfamiliar with. I'd also ask Jethima from upstairs or go bug Moni to identify ingredients and then to cook them for me. My interest vegetables and local ingredients grew and if you've ever enjoyed winter vegetables in Bengal, you'll understand just why I succumbed. What a glorious variety there was! Leafy greens, beans, brinjals, gourds, root veggies, the list can go on and on. 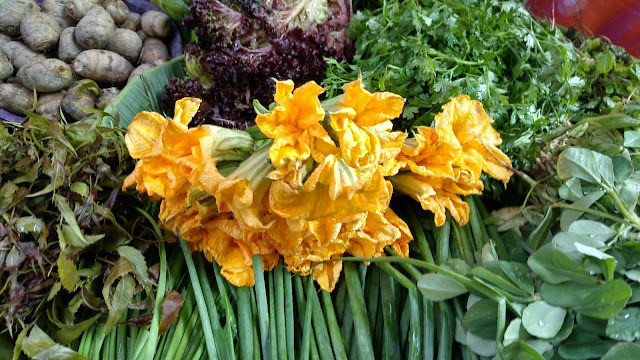 And among all this bounty I found an array of edible flowers and inflorescence that are all a regular, even mundane, part of the Bengali kitchen, enjoyed in season and then looked forward to once the season was over. 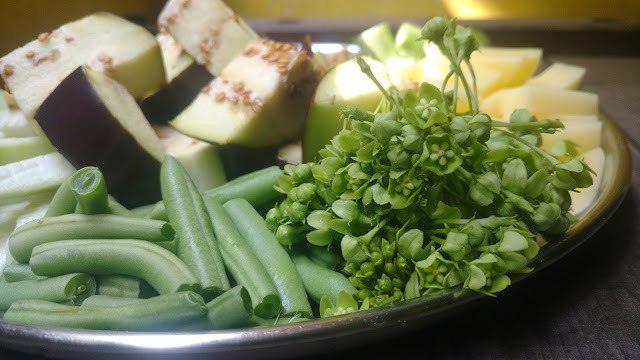 As I took photograph after photograph the subziwala, seeing my interest and quite entertained by my enthusiasm, started bringing unusual seasonal ingredients to show me every morning. I'd happily be awake at 6 am waiting for him to make his first circuit of our goli. Thanks to him I learned about many vegetables that are a part of the Bengali's winter meals. Not only did I learn from him, Moni and Jethima, the neighbourhood mashimas (aunties) also started educating me, making the entire experience richer and so much more interesting. Edible flowers maybe trendy today and perceived to be modern and hip but for the Bengali they are a part of everyday meals and I discovered a wide variety in Kolkata, some of which I have listed here. Whether it's the blooms, inflorescence or stems, the flowering portions of many plants are commonly cooked into simple dishes or more elaborate fare. Malabar Spinach or Pui Shaak is a common ingredient in many Indian kitchens, but did you know the inflorescence on this plant is also eaten? It's sold separately as an individual ingredient and I first saw it on the subzi cart. Similarly the inflorescence on Spinach or palak, called Shish Palong in Bengali, is also a delicacy and Jethima made a quick stir fry with potatoes for me. Shapla or water lilies also star on Bengali menus. The stem is cooked with prawns or made into fritters. While prepping the stems may feel tedious the resultant fritters are perfect as a snack at tea time or are served as the accompanying bhaja in the daal course of a traditional Bengali meal. The flowers aren't eaten but they look lovely floating in a flat vessel full of water. Then there were onion scapes or Peyaanj Koli as we call them in Bengali. Such a pretty vegetable! Mostly added to chorchoris or made into a simple bhaja with potatoes, the markets are filled with these in season. This post would be incomplete if I didn't mention Kumro Phool or pumkin flowers. Mostly served batter fried, sometimes with a stuffing of prawns (yes, we Bengalis cook many veggies with prawns) I had plenty of these thanks to my beloved Jethima. On my last trip to Kolkata I encountered Jukti Phool. 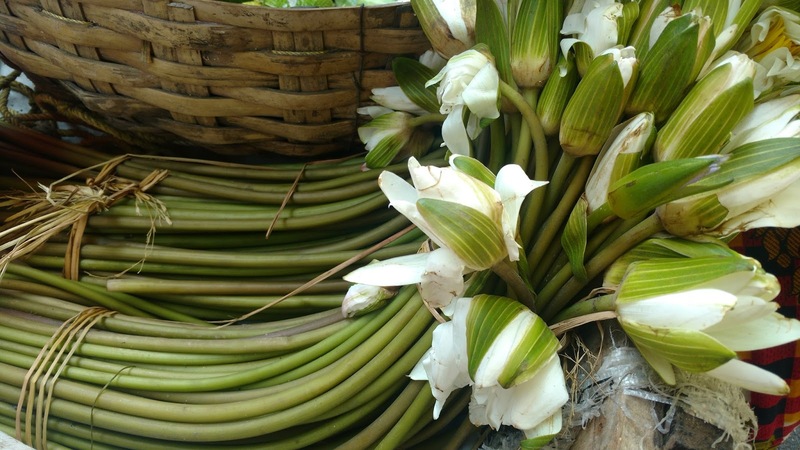 This flower enjoys a very short season and, from what I understood from the vendor in Gariahat market, is gathered from plants growing in the wild. 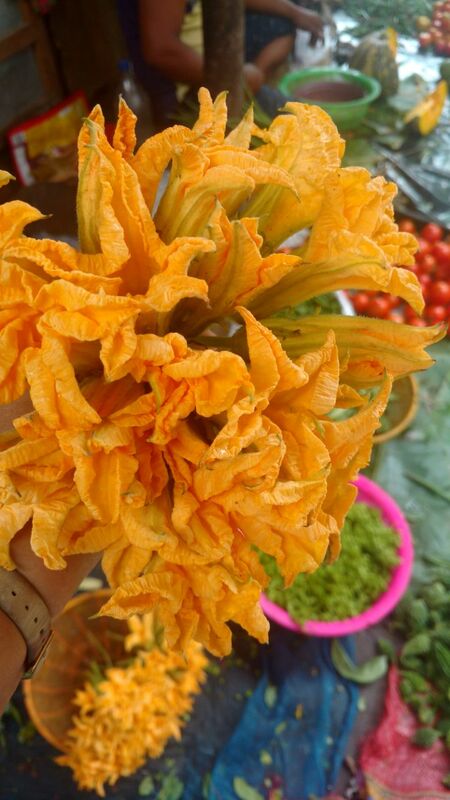 A strongly bitter flower, it can be stir fried with potatoes and panch phoron or can be used in a sukto to impart the bitter notes. 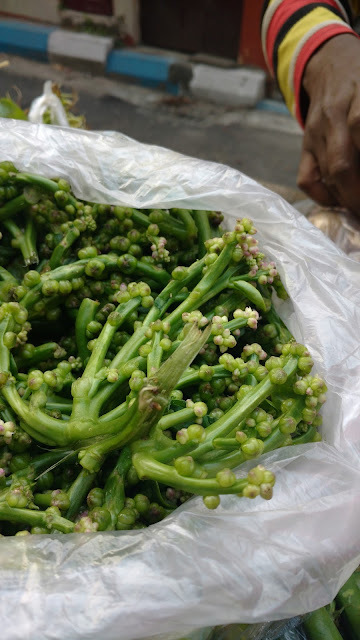 I also found Bok Phool or Agasti phool on an earlier trip to the market. These are cooked by many communities across India and I have seen many getting excited over them on myriad food groups on Facebook. These too are mostly batter fried and served as a tasty snack, much looked forward to by the Bengalis when in season. A simple chickpea flour batter seasoned with salt and chilli powder, a dash of turmeric and some nigella seeds is made, the flowers (stamens removed) are dipped in and then deep fried till crisp and golden. Sometimes maida and/or rice flour are added to make the batter lighter and the fries crisper but all these are variations from kitchen to kitchen. 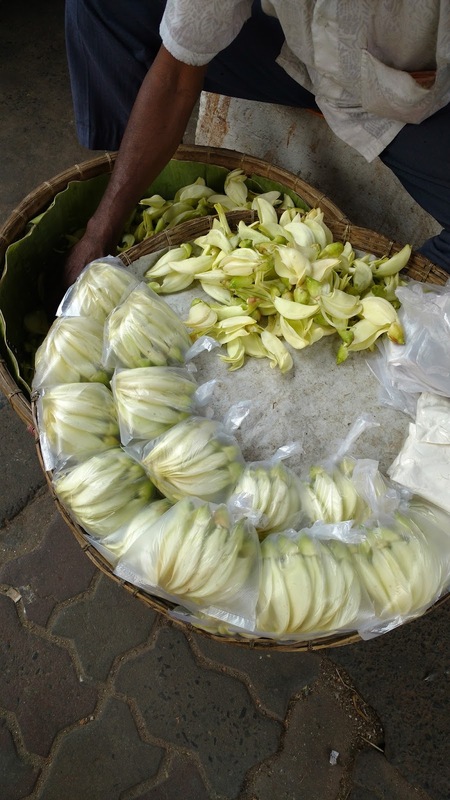 Mocha or banana blossom is very widely known so it wasn't really a discovery for me. This much treasured ingredient in cooked a million ways by the Bengali - ghonto, chop, with prawns, chop with prawns... the list can go on and on. 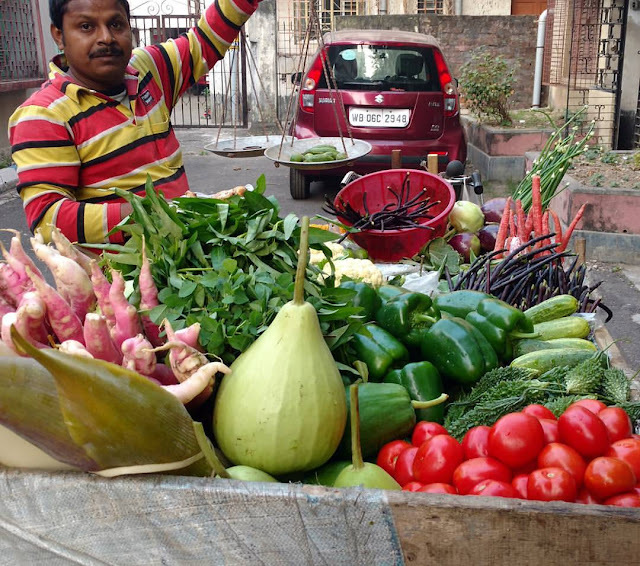 And here's a picture of the man himself, the shobjiwala or veggie vendor. As I write this I realise I've never asked him his name as I always called him 'bhai' or younger brother. Such a lovely post so many memories made so much discovery and so many new things that one has learnt from this. i have always been a fan of the kumro-phool from the first bite of a bhajjia in Kolkata 19years ago but the jhuti phool was a complete eyeopener and delicious to boot. The Shish palong I have yet to eat and its something I have bookmarked for my next trip to Kolkata :)thank you for sharing this. A delightful informative post. I have cooked certain flowers and Jhuti phool is definitely new to me. I experienced this thrill in Bangalore when the soppu vendor, your bhaaji wala came by. I tried many new veggies and flowers there. What I love is how the vendors educate you on the goodness of their wares and even guide you about the cleaning and cooking.